A little spark of kindness can put a colossal burst of sunshine into someone's day! 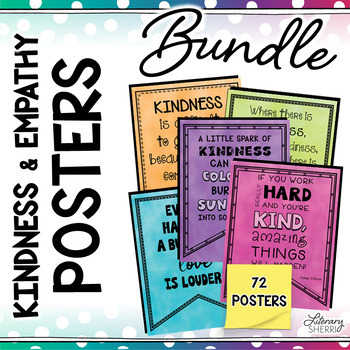 Encourage kindness, empathy, compassion, & inclusion in your classroom with 72 engaging, student-friendly, and ready to print-n-go bundle of posters that help build a nurturing classroom community. 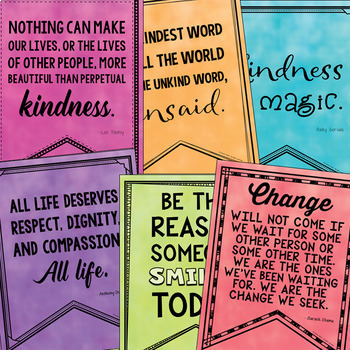 Perfect for your classroom, bulletin boards, quote analysis activities, or hall, cafeteria, library, office, or homeschool decor! 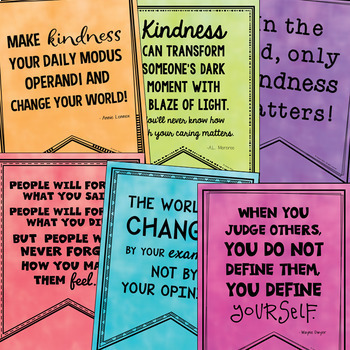 These 72 KINDNESS QUOTES and EMPATHY AND COMPASSION QUOTES posters (in both color and black-and-white) can also be used as thought-provoking conversation starters or writing prompts, especially when used in conjunction with random acts of kindness projects, growth mindset, or novels such as Wonder by R.J. Palacio. Save 20% when you purchase this budget-conscious bundle! Teaching tips, ideas, tools, and strategies to help you use these effectively in your classroom. 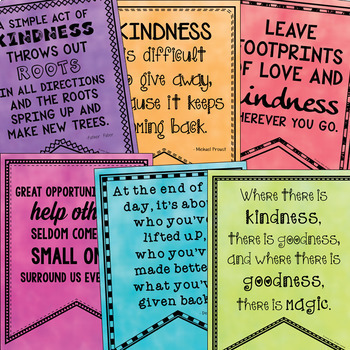 Looking for kindness, empathy, or compassion quotes that I have not included? Leave me a comment or question and I'll be glad to add what you're looking for! Click here to see Growth Mindset resources that may also interest you. Click here to follow me and be the first to know about store discounts, free products, and product launches! My resources are created entirely by me, based on more than 25 years in the field of education. I do not work with ghostwriters or otherwise contract out content creation. I respect and honor copyright and trademark laws. Copyrighted or trademarked text and images have been used under license from and with permission of the owner, as noted on the credits page. © 2012 to present Literary Sherri. All rights reserved by author. These materials are intended for personal use by one classroom teacher only. Printing and/or copying for more than one teacher is prohibited unless and until additional licenses have been purchased. You're welcome to place this file on your own password-protected Learning Management System (LMS) or school intranet server, such as Canvas, Blackboard, or Google Drive, for access by your students only. However, if other teachers have access to the resource, the purchase of either additional licenses or a school-wide license is required. This product may not be distributed or displayed digitally for public view. Creating derivatives of this resource, claiming all or parts of this resource as one's own, and/or copying any part of this product and placing it on the Internet is strictly forbidden and doing so is a violation of the Digital Millennium Copyright Act (DMCA). Thank you for understanding that clip art and graphic elements found in this PDF are copyrighted and cannot be extracted and/or used outside of this file. HAPPY TEACHING -- I'M CHEERING YOU ON!